The proposed 'Sherin's Law' would make it a felony to leave a child at home alone, US media reports quoted activists involved in the move as saying. Houston: Efforts to have a new law in the US state of Texas which would make it a felony to leave a child alone at home is gathering steam and has won the support of a lawmaker in whose constituency 3-year-old Indian girl Sherin Mathews was found dead in a culvert, a media report said. 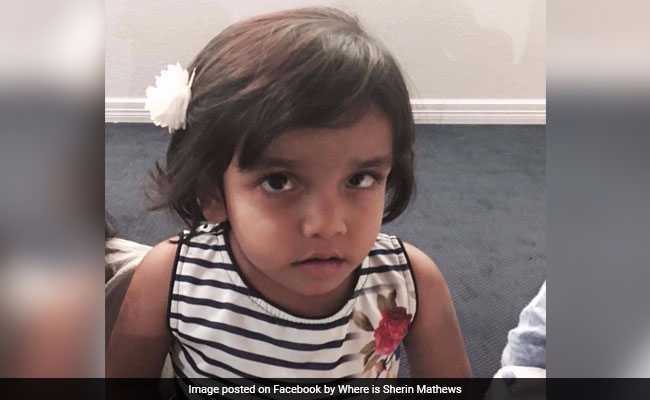 The decomposed body of Sherin was found in Richardson city in suburban Dallas on October 22, over two weeks after she was reported missing by her Indian-American foster father, Wesley Mathews. Linda Koop, the Republican lawmaker from Dallas, is working with the two activists on the proposed legislation, The Dallas Morning News reported. Ms Koop said she hopes to find ways to make the law simple but impactful so it can be passed as soon as early next year. "Little Sherin was killed in a part of my district," ,Ms Koop said. "There's a lot of healing that needs to be done, but there is also a law that needs to be passed," she added. Two Texas women activists, Reena Bana and Shanna Poteet Rivera, said they hope their proposed legislation which they call "Sherin's Law" will prevent deaths like Sherin's. Authorities say Sherin, who was adopted by the Indian- American couple, Wesley and Sini Mathews, died of "homicidal violence." "What this is going to do is keep people on their toes," Bana, orginally from Pakistan, said. "This is giving people more accountability to take action, and it's helping out cases like this from happening more often." Wesley, Sherin's father, initially told authorities in October that his daughter disappeared after he put her outside at 3 am as punishment for not drinking her milk. Mathews had waited hours before calling police, authorities said. Wesley later told police that Sherin had died from choking after he "physically assisted her" with drinking milk. On October 22, Richardson police confirmed that the body of a young child found in a culvert was that of Sherin. Police arrested Wesley on October 23 on a charge of injury to a child. He is being held at the Dallas County jail on USD 1 million bail. Sini, Sherin's mother, was arrested November 16 on a charge of abandoning or endangering a child. She is also in the Dallas County jail on USD 250,000 bail. Bana and Poteet Rivera said they were upset to learn that Sherin had been left home alone shortly before her death, and that Texas state has no laws that would penalise any parent who did the same. "You can leave a child at home at any age, but it's not wrong unless something happens to them," Bana said. Dallas attorney Bilal Khaleeq said he began working with the pair after they came up with the idea for Sherin's Law. "The law is still in its infancy, and we've had a couple of drafts. As we talk to other people, we will be revising the language," Mr Khaleeq said. He said they are researching what other states in the US are doing when it comes to reporting missing children and preventing parents from leaving them alone. Sherin's Law would also require that any adult who witnesses or has personal knowledge of an abused child report it to authorities within 48 hours.